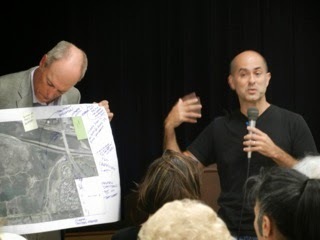 FIGHTING THE I-405 TOLL ROAD! 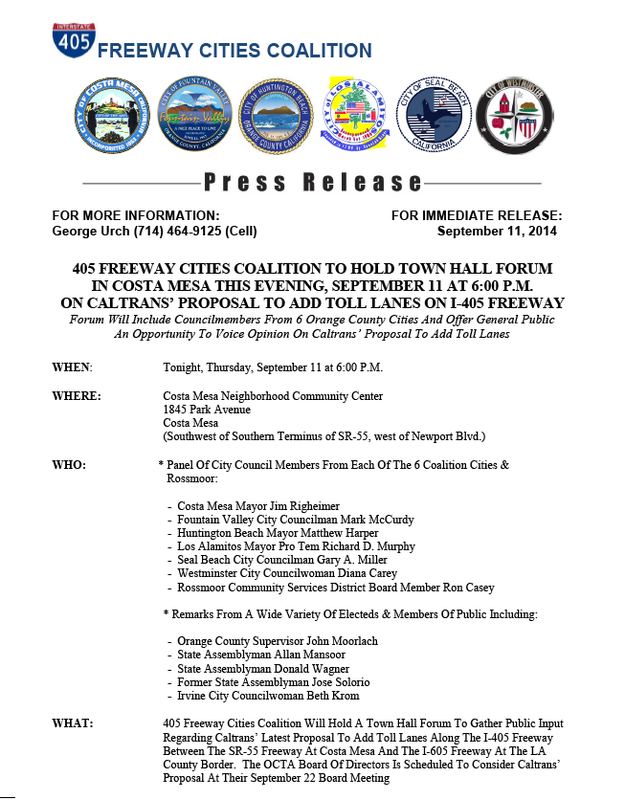 Tonight, September 11, 2014, representatives six Orange County cities which form a coalition against the current scheme to create Toll Lanes on the I-405 Freeway from Costa Mesa to the Los Angeles County line will hold a town hall to gather input from the public on this plan. 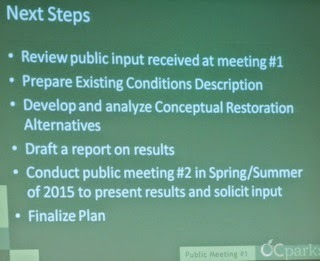 The Orange County Transportation Authority (OCTA) Board of Directors will consider this proposal at their meeting on September 22nd. 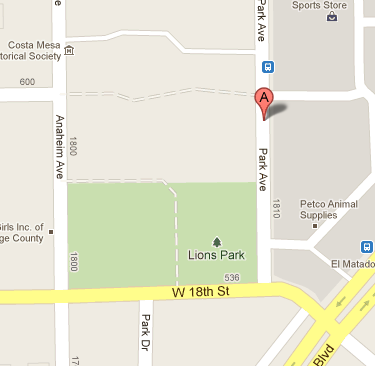 This meeting will be held at the Costa Mesa Neighborhood Community Center, 1845 Park Avenue (Lions Park) and will commence at 6:00 p.m. I suggest an early arrival if you plan to attend and make your views known because parking will be at a premium. Perhaps one of the homeless folks that infest that area will offer valet parking. Sorry - couldn't resist. 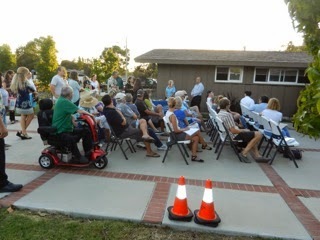 According to the press release on this meeting, which is reproduced below, in addition to elected officials from Costa Mesa, Fountain Valley, Huntington Beach, Los Alamitos, Seal Beach, Westminster and one from the Rossmoor community, it is anticipated that many other current and former elected officials will attend and offer their comments. As I looked down that list I see several who are in the midst of campaigning for new jobs or to keep their current one, and some of them who will soon be out of a job. 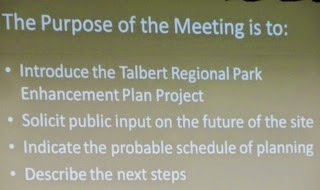 Since this meeting is happening in Costa Mesa I fully expect Mayor Jim Righeimer to use this as yet another stop on his campaign for re-election. If you attend, look around the room. I'm sure you'll see many of his sycophants and hangers-on, ready to offer cheers as their guy speaks. I make light of this issue, but it IS serious. 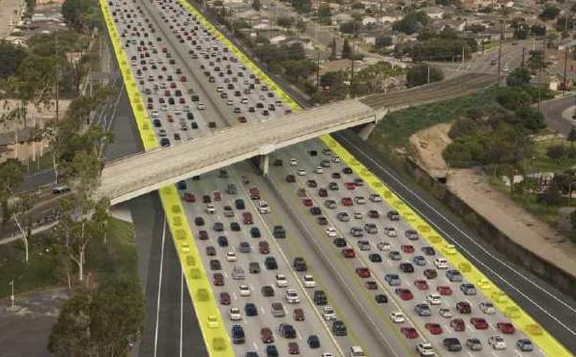 The folks at CalTRANS pulled the old bait-and-switch on us with this scheme and every city in the coalition will be negatively impacted by the change. It's just unfortunate that this situation happens in the middle of campaign season, during what is certainly going to be one of the most contentious, nasty city council campaigns in recent memory. It might be hard to sort the facts from campaign rhetoric tonight. I agree with the need to speak out on this issue and to NOT turn that stretch of freeway, with High Occupancy Vehicle (HOV) lanes, into toll lanes that will, 1) severely hamper drivers from exiting the freeway to reach shopping venues in the corridor cities and, 2) generate cash for CalTRANS to use elsewhere. I hope you'll plan on attending and make your views known. I'll be very interested in your take on the meeting if you attend. Hope to see you there. Today, September 11, 2014, marks yet another painful anniversary of that date thirteen years ago when our world was shattered by the events that occurred in New York City, Washington, D.C. and in a remote field in Shanksville, Pennsylvania as terrorists hijacked airplanes with the intent of destroying our way of life. In some ways they may have succeeded. I've written about it each year. You can read what I wrote last year HERE. That post included links to previous entries, so I encourage you to follow them and see what I've written in the past. Based on recent events - the beheading of two MORE American journalists, the rise of the Islamic State of Syria and Iraq (ISIS) and the ongoing turmoil between Russia and Ukraine - we are aware that our world is far from a place of peace and tranquility. Those of us who watched on September 11, 2001 as the airliners crashed into the World Trade Center Towers, which subsequently imploded and virtually vaporized so many Americans and others, and saw the aftermath of the crash of another airliner into the Pentagon and the giant hole in that field outside Shanksville, PA where brave Americans tried unsuccessfully to take back their hijacked plane from the terrorists, will NEVER forget that time. Just as the events of December 7, 1941, when Japan launched a cowardly sneak attack on our base at Pearl Harbor, were burned in the brain of my parents generation, the events of 9/11/01 will remain with me and most other Americans over the age of 12 at the time. 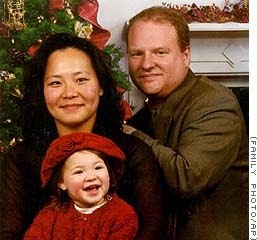 I hope you will take a few minutes sometime today to pause to recall those events, the lives lost - like young Christine Hansen, the youngest person to die in those events that day - that date and how our world was permanently changed from that point foward. Today, more than at any time since that date, we must be vigilant and our elected leaders MUST step up to their responsibilities to keep our country and its citizens safe from the cowardly terrorists who wish to subject us to their form of government. This video is among the hundreds created over the years, but I think it captures the essence of that terrible day. 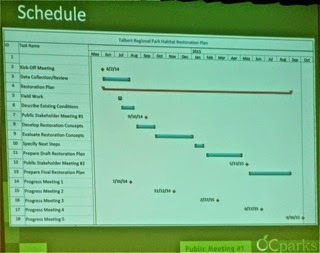 Last night your humble correspondent joined around 40 of your friends, neighbors and other interested citizens at the Costa Mesa Neighborhood Community Center for a workshop conducted by members of OC Parks and their consultants to discuss the plans for rehabilitation of Talbert Regional Park and, most specifically, the southern-most segment below Victoria Street. 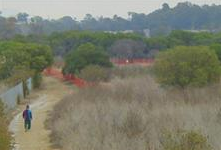 There were many familiar faces in the group, including many environmental activists who have worked hard on Fairview Park and Banning Ranch issues. 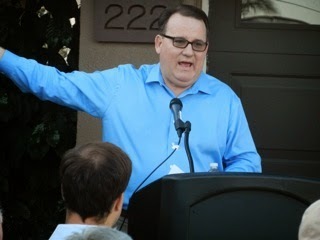 Plus, The City of Costa Mesa was represented by Chief Executive Officer Tom Hatch, Assistant CEO Rick Francis and Director of Public Services Ernesto Munoz. Munoz must be working the swing shift because he's been at each of the three evening meetings I've attended this week and will certainly be a the I-405 meeting later tonight, also at the Community Center. 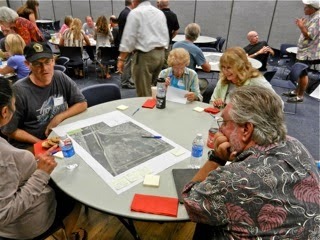 Termed-out Orange County Supervisor John Moorlach also attended the meeting, as did councilwoman Wendy Leece and council candidate Jay Humphrey, both of whom actively participated in the process. Rather than explain the steps taken by the consultants I've presented images of the slides they used as they guided the discussion. 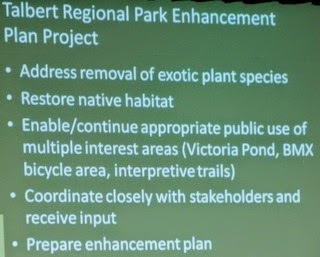 Following an introduction by OC Parks staff and the consultants the attendees were asked to break into groups and discuss their thoughts about what they'd like to see, or not see, in the southern section of Talbert Park. After a half-hour or so each group was asked to present their ideas to the body as a whole. 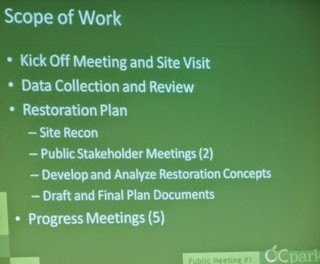 That data will be accumulated and included in the mix as this process goes forward. Quite honestly, I expected less when I showed up last night, but I think the time was well-spent. That seemed to be the consensus of the participants with whom I spoke after the meeting ended, too. The proof, of course, will be what the end-result of this process turns out to be. I do know that several of the participants last night are VERY passionate and focused on these issues, so they will remain attentive to the progress, or lack thereof, as this moves forward. Information will be posted on the website shown on the last slide. 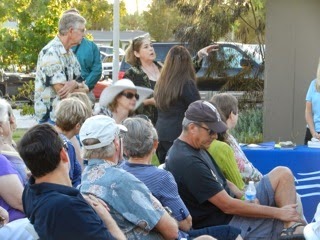 Yep, a funny thing happened on the way to a neighborhood community meeting on the proposed expansion of Orange Coast College - a "Jim Righeimer For City Council" campaign stop broke out! Well, that's what it seemed like, anyhow. 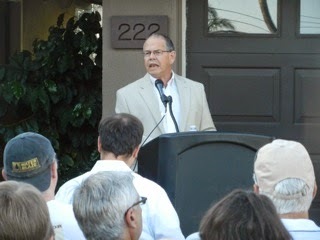 Beginning at 6 p.m. sharp a crowd of around 60 Costa Mesa residents gathered on the driveway at 222 Hanover Drive to hear Mayor Righeimer expound on the planned expansion of our local community college, bemoan the lack of outreach, the probable increase in traffic and acknowledge that there is really almost NOTHING the City can do about it. And yet, there he was, smack-dab in the middle of his run for re-election, surrounded by a handful of senior city staffers for moral and technical support, complaining about something he can do nothing about. This was less than 24 hours after he and his cronies crashed a campaign event for Katrina Foley, Jay Humphrey and Wendy Leece the night before, HERE, and HERE. In addition to Righeimer and his pal, Mayor Pro Tem Steve Mensinger - who lurked and smirked around the perimeter of the crowd like a Secret Service body guard - the attendees included Chief Executive Officer Tom Hatch; Public Services Director Ernesto Munoz; Transportation Services Manager Raja Sethuraman; Development Services Director Gary Armstrong; Communication Director Bill Lobdell; Assistant Development Services Director Claire Flynn; Management Analyst Dan Baker and Hatch's Executive Assistant, Kelly Shelton. 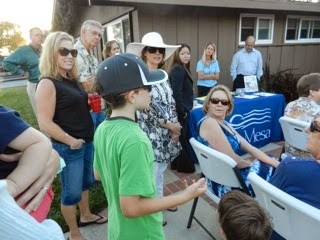 Plus, councilwomen Sandra Genis and Wendy Leece were also present. I'm not sure whether having 4/5 of the City Council present constituted a Brown Act Violation or not. Only three of them spoke - Righeimer and Genis spoke on the issue and Leece had to verbally slap Righeimer upside the head once to remind him that he shouldn't be campaigning. It made me smile. 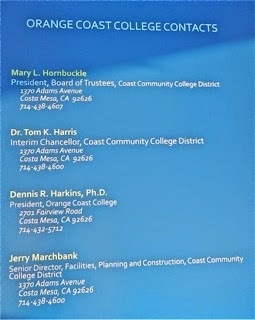 Also present was former mayor Mary Hornbuckle, currently President of the Coast Community College District Board of Trustees, which administers Orange Coast College, among others. She has served on that board for nearly a decade. 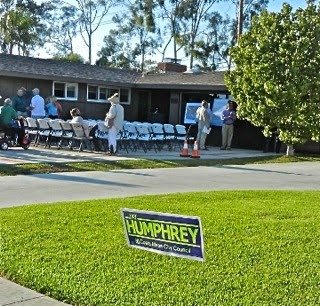 As I cruised through the College Park neighborhood where the meeting was to be held I couldn't help but notice the Jay Humphrey For City Council campaign signs that peppered many of the lawns. His were the only signs visible, including right next door to the home where the meeting was to be held and right in the line of sight of Righeimer as he spoke. 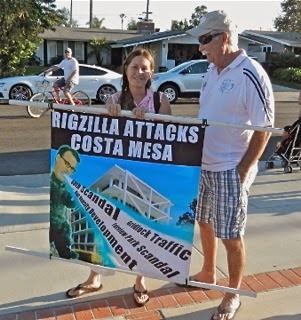 Also in his line of sight was a large banner held by activist Cindy Black, shown here with Righeimer supporter and candidate for a seat on the Mesa Water District Board, Ron Amburgey, as he admired the sign. I suspect Righeimer was not happy with that banner being so clearly visible to him and certainly was not happy when Black occasionally flashed another smaller sign which said in bright, bold, red letters - "I DON'T BELIEVE YOU!" Here are three graphics that were posted for all to see. 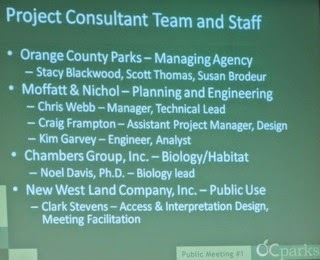 They present an image of the changes proposed, a city-generated synopsis of the impacts of the changes and a list of OCC representatives to contact. Additionally, you can read the Draft Environmental Impact Report HERE. During the meeting Righeimer told us he would be meeting with OCC President Dennis Harkins next week to discuss this program and its impacts. 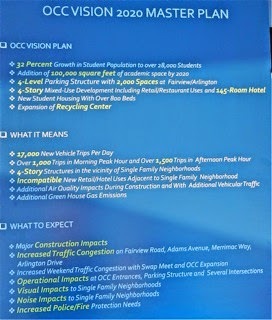 He spoke of the planned increase of students - he mentioned 6,922 additional folks attending within the next few years. This will still be short of the highest levels attained a few years ago, but the planned infrastructure changes will put a serious crimp on traffic flow and tax other infrastructure elements, as well. He complained that OCC needed to define the reason for these changes to justify the $700 million bond issue. He and Munoz reminded us of the probable traffic impacts of this project at full build-out - more than 17,000 daily vehicle trips. 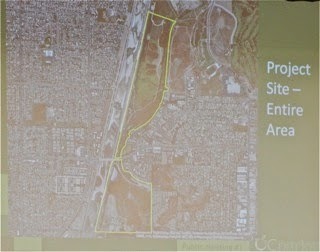 That's much more than the 13,500 trips associated with the Banning Ranch development if it is completed. 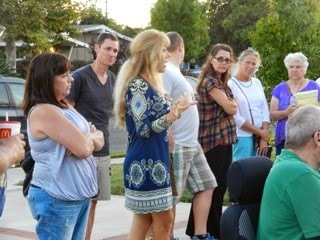 More than two dozen residents - a mixture of College Park residents who walked or rode bicycles to the meeting and "regulars" at council and commission meetings - asked questions and made comments covering a wide range of issues. They dealt with the presumption that this expansion was to accommodate an increase of foreign students because they pay a higher fee to attend. Some speculated that the college was being prepared to convert to a 4-year university. 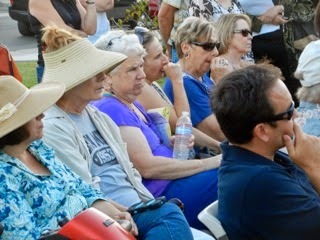 Others worried about parking throughout their neighborhoods. 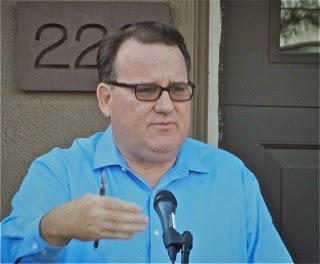 Presently there are signs posted indicating that the on-street parking is for permitted residents only. Several speakers pressed Righeimer for alternatives - which he didn't have. One very young fellow spoke, complaining about the proposed traffic and the failure of the college to build a Science Center on the Fairgrounds space. Speakers mentioned the shortage of police officers and the impacts this expansion would have on the CMPD and the Fire Department. There were no members of the CMPD or CMFD present. During his frequent postulations he used the phrase "come from", as it "What's your come from?" I assume he meant, in the context of the college, what's your goal? Sometimes he speaks in tongues. 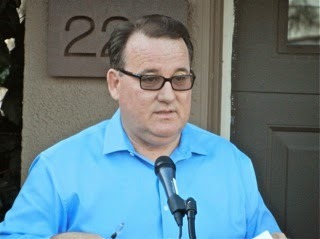 He directed Hatch to have the City Attorney look at the issue. Do you smell even MORE legal fees? I do! 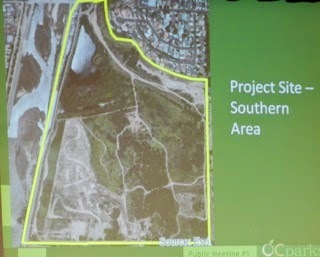 Early in the discussions one speaker observed that Righeimer frequently said The City should be run like a business, and this move by OCC seemed to be following that philosophy - running it like a business. He quickly denied making that observation about the City. I glanced around and saw many folks who follow these issues just shake their heads because we all have heard him time after time expound on how the City SHOULD be run like a business. For him to deny it only adds fuel to the belief that you just can't believe anything he says. WENDY STEPS ON HIS LIP! A little later Righeimer tried to fold into the conversation his campaign rant about the previous council "blowing through" $35 million in reserves. 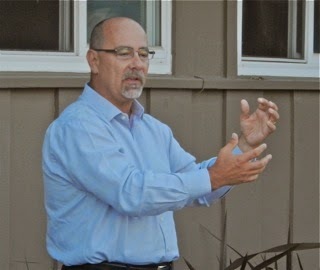 That's when Leece spoke up and corrected the record and told him to stop campaigning. She reminded him that the previous councils had actually built-up those reserves and found it necessary to spend them during the economic downturn the end of the last decade. For once he didn't have any kind of a snappy retort - because he was just flat-out wrong! Near the end Righeimer asked Hornbuckle, who had been quietly and intently listening to each and every speaker, to say a few words. 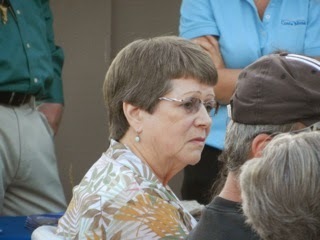 She stepped right up and told the crowd about the process that was being followed. She said the whole issue is being reviewed and that the Environmental Impact Report is being revisited, and that nothing is going to happen until the first of the year. She said everyone will have a chance to observe the new plans and comment upon them BEFORE any final decisions are made and the proposal are passed on up the line to the State. 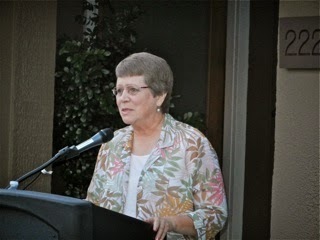 She told us that the State has encouraged colleges to become more "entrepreneurial" because funding is so tight. She calmly fielded every question asked with a steady demeanor that has marked her tenure in public life. Watching her in action made me long for the good old days, before mindless partisanship took control of our city government and decisions were made by the elected leaders that were best for the city without consideration for individual political careers or party edicts. At one point, as she explained her views, she observed that she hoped those running for office this year would NOT make the OCC situation part of their election platform. Righeimer knew what she meant. She made me smile. 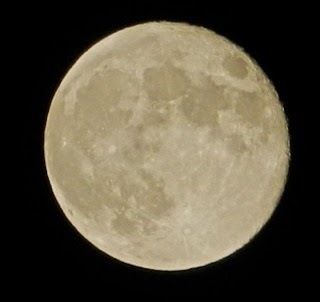 So, the evening ended as the sun had already set and this glorious moon was about to rise, with Righeimer's instruction to the staff to stay on top of this issue and to communicate with the attendees on any changes/progress that's being made. Keep in mind that the City has very limited authority to do ANYTHING about any of this. It's going to be very interesting to see what kind of changes are made to this plan by the college district and college officials as the fall moves on in this election year. IMPORTANT ALERT! WEST NILE VIRUS! ALERT! 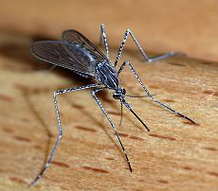 WEST NILE VIRUS IS SPREADING! 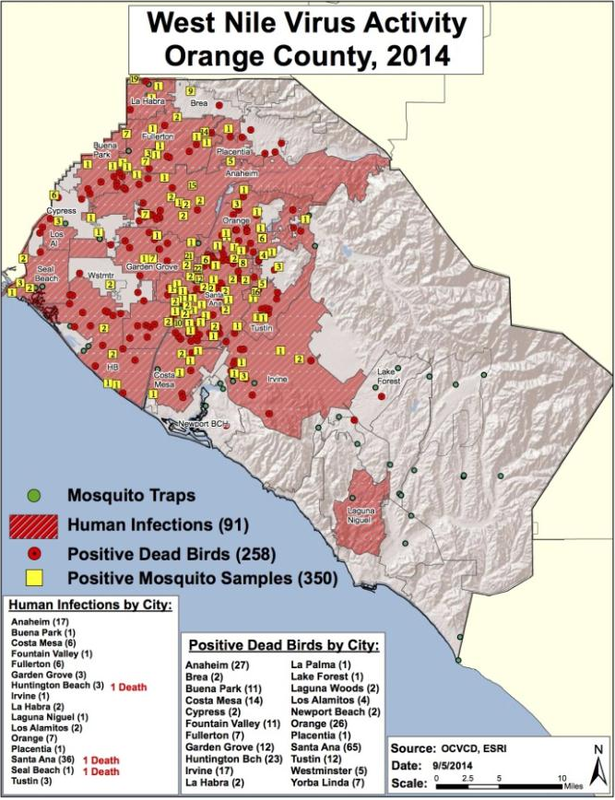 The City of Costa Mesa issued a special alert to residents about the growing problem of the West Nile Virus, HERE. Orange County Vector Control (714) 971-2421 or (949) 654-2421, Monday through Thursday 7 a.m., - 4:30 p.m. and Friday, 7 a.m. - 3:30 p.m. 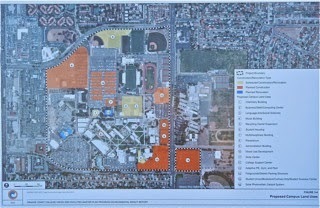 In case of suspected or confirmed cases of West Nile contact Orange County Epidemiology, (714) 834-8180. 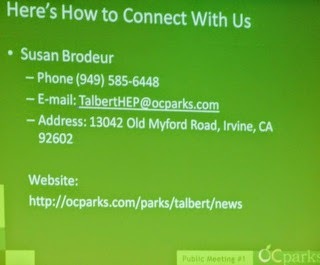 Representatives from OC Parks will hold a workshop for the Habitat Restoration Plan for Talbert Regional Park - which is adjacent to Costa Mesa's Fairview Park - tomorrow, Wednesday, September 10, 2014 from 6:30-8:30 p.m. at the Costa Mesa Neighborhood Community Center, 1845 Park Avenue (Lions Park). 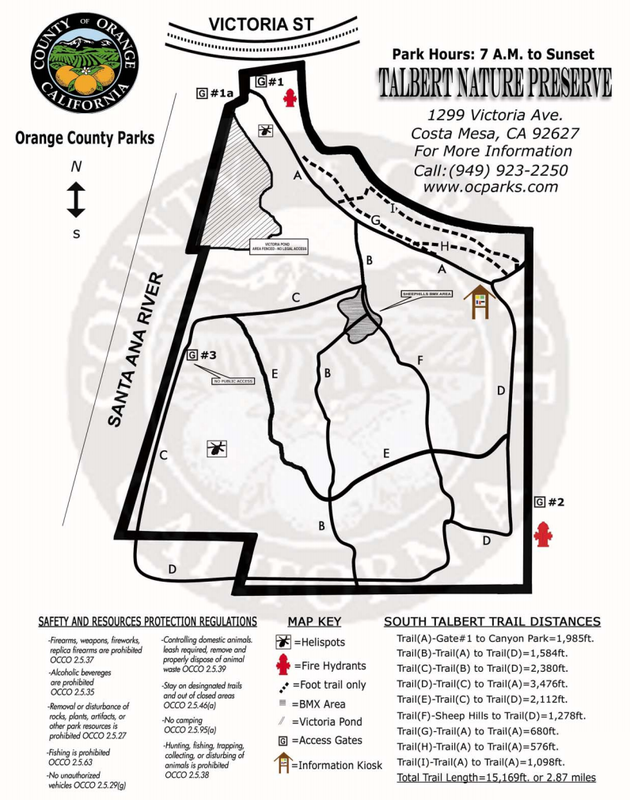 You can read the announcement of this event on the Costa Mesa City web site, HERE, and read more about the park itself on the OC Parks web site, HERE. 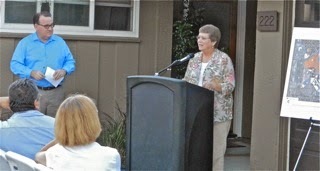 Talbert Park has been in the news a lot over the past several months. 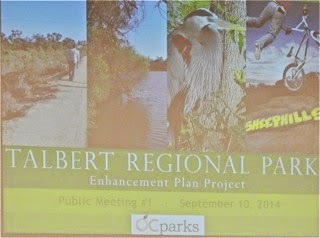 You can find links to several Daily Pilot articles on Talbert Park HERE. For those interested in the future of this amazing natural resource, please plan to attend this informative meeting tomorrow night. See you there.